Upsets abound in Week 7. Are the Senators ready to rule? Or is the Master Skaro’s own worst enemy? 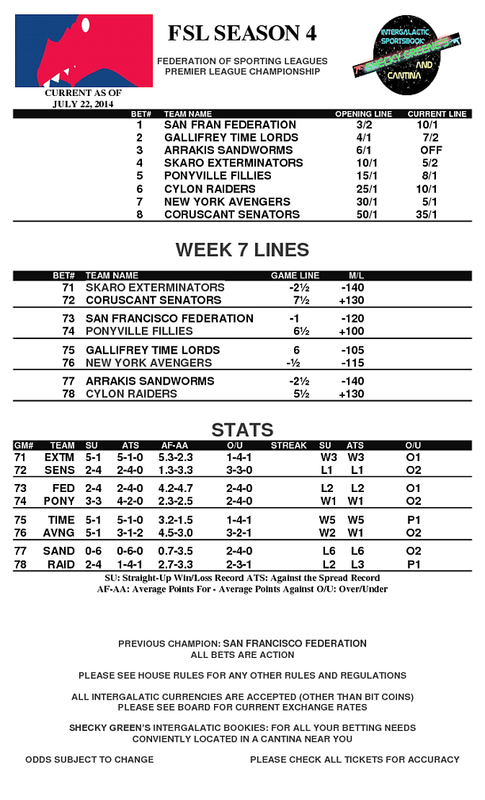 Hot off the presses we have the lines for Week 7. World-shattering news as the league puts Coruscant in new hands. Who will be the Heir to the Empire? Also Shecky is running a special promo: Get a 25% bonus on all DOGECOIN Deposits into your account. More Info on this promo can be found at your local Cantina. Skaro’s new acquisition has a lot to say, and Palpatine declared incompetent as Coruscant’s offense comes to life. Hot off the presses we have Week 5’s Lines straight from Shecky himself. East meets West in Pern for a battle dominated by players from Ponyville, San Francisco, Gallifrey and New York. But controversy still brews over the Palpatine ownership.